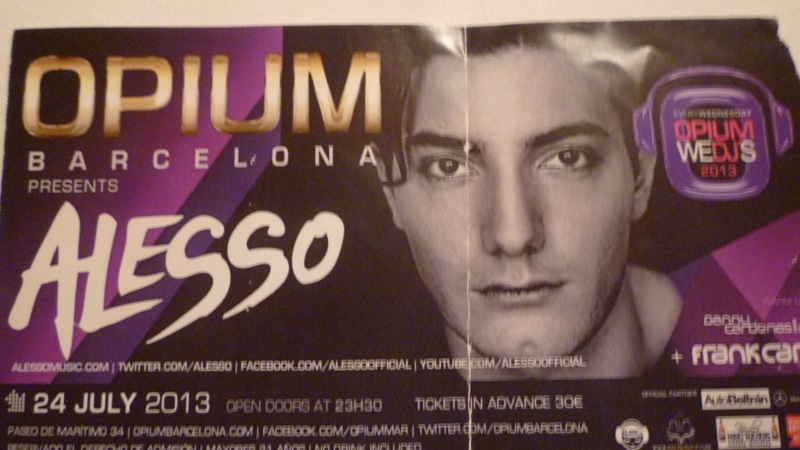 After the flamenco show on Wednesday, our tour group leader got those of us who were interested tickets to see DJ Alesso at a club called Opium. The show had been sold out for a while, but our tour group leader knows a guy at the club who was able to get some tickets. The flamenco show was finished around 10:30 or 11 pm, so we had a couple of hours to kill before things got hopping at Opium. We headed over to a bar called Port Olimpic close to the club, where they played good music for dancing and had discounted drinks for us. I had decided not to drink anything since I was terrified about having another issue getting back to the hotel and/or getting mugged. By the time we headed over to Opium, I almost just felt like going back to the hotel, but I decided to stay out since I wanted to see DJ Alesso and also Opium, which is supposed to be the epitome of the European club scene. When we got to the club, we got to skip the line which was hundreds of people long. It was because our group leader knows a guy at the club, but it still made me feel really cool. By this time, it was 1:45 am, and it was packed inside. Apparently clubs in Spain don’t really get popping until 2 am. The club was enormous, but if you were on the dance floor, it was nearly impossible to move. DJ Alesso was awesome, but by the time 2:45 rolled around, I was ready to leave as it had been a long day. I caught a taxi back to the hotel with another girl. We got back around 3 am. We weren’t the first to leave, but a lot of people stayed until 5 or 6 am! I don’t know how those kids have the energy to party that long! Ah, to be young again. . .